Although I was pretty tired from the two day conference I just got back from, I decided to head out to catch B-boy Drew Looner's breaking class at Athletic Playground in Emeryville. Athletic Playground is a small and friendly space where they teach all manner of athletic pursuits from gymnatics to parkour, acro-yoga, and something called "monkey conditioning" which sounds really fun. There were seven of us in Drew's breaking class, ranging in ages from teen to adult, most of them appearing to be at an intermediate level, knowing some basic breaking moves, toprock, floorwork and freezes. Drew began the class with a light warm up, and then swiftly launched us into doing "ten sets of ten rounds" in pairs. This involved every one alternating doing ten "rounds" of floorwork, i.e. doing a complete 360 on the floor ten times using whatever moves we knew, ideally beginning with some toprock and ending with a freeze. Each of us were to do ten sets of these ten rounds, which is a helluva lot of dancing. As an added incentive / challenge, Drew told us to record the rounds so we can watch ourselves and critique it for later, which is always a good suggestion. After this, he had us do this interesting exercise that was about pushing our bodies beyond what our minds think we can do. A lot of breaking involves physically demanding moves and freezes that you have to be both mentally and physically prepared for. Often I find that my mind gets in the way of allowing me to even attempt something because of fear, anxiety and doubt. For this exercise, Drew had all of us doing pullups to get to that point where we think we can't do one more, to get to the 99% exhaustion level, and push through that. It didn't matter if it was 5 or 50 pullups, as long as you got to that point and fought through it. Definitely a demanding exercise that I'm going to sore from all day, but very worthwhile. As a final exercise, Drew taught us a move that he called "in and outs," which I call "kick outs." It's a pretty simple move involving rapidly kicking out your legs in various directions, which is useful as styling and as a mini-freeze in a set. I was pretty wiped at this point, but liked working on this. Finally we did a warm down and hung out introducing ourselves. All in all, Drew Looner's class was really fun and challenging, with a good mix of instruction and practice time. 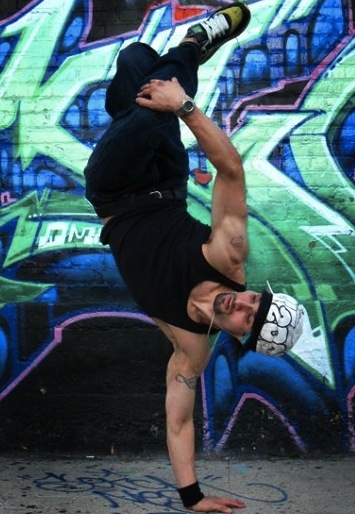 He has a positive, encouraging energy and a passion for the dance that really comes through his teaching. I look forward to coming back, because I need a good teacher to push me beyond what I think I can do. Drew Looner teachers on Wednesdays and Sundays at Athletic Playground in Emeryville. Check his website for other special workshops and privates. Thanks fo tha GOOD words, Rik! thanks, Drew. I think it’s always interesting the different terms that different communities use for the same moves depending on where you are. Someone needs to do a thesis on this.